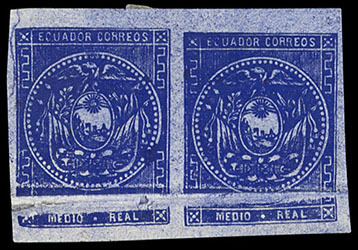 Ecuador, 1865, ½r Blue, Embossed Arms, showing a bit more than half of seal at right, without gum, margins large to a bit in at left, bright color, F.-V.F., rare in unused condition. Scott No. 2d Estimate $500 - 750. 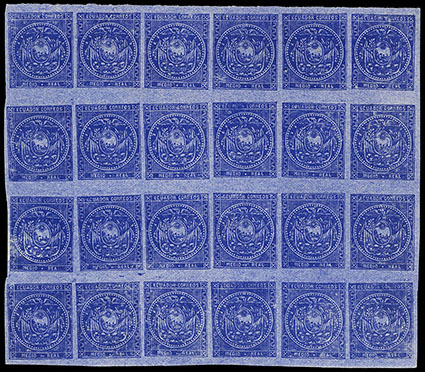 Ecuador, 1865, ½r Blue on Surface Blued Paper, four mint blocks of four showing irregularities in the impressions in the 3rd period printings; blocks from positions 7-8/ 19-20, 23-24/ 35-36, 44-45/ 56-57 (position 56 with constant colorless flaw in tablet) and 61-62/ 73-74; couple block with flaws, F.-V.F. 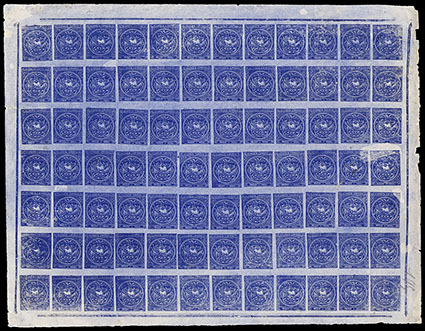 Ecuador, 1865, ½r Ultramarine Blue on Surface Blued Paper, six mint multiples showing water-soluble ink impressions; includes four horizontal pairs with corner margin position 1-2, position 11-12, 25-26 and 61-62, strip of three position 3-5 and strip of four position 56-60; all with ample to large margins, full o.g., strip of five with a few flaws, otherwise Very Fine. Ecuador, 1865, ½r Deep Ultramarine, Blue Surface Paper, horizontal pair showing a very pronounced 1-2mm horizontal pre-printing paper fold which separates the value tablet from the rest of the stamp, large part o.g., ample to large margins, large part o.g., slight split at end of fold, Very Fine, a very infrequent paper variety; with 2013 Moorhouse certificate. Scott No. 2 Estimate $500 - 750. 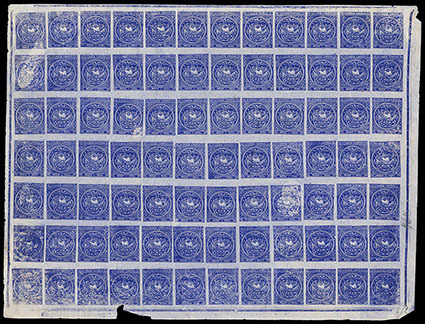 Ecuador, 1865, ½r Ultramarine on Surface Blued Paper, block of 24 (positions 31-36//67-72), o.g., never hinged, ample to large margins, bright and fresh, Very Fine and choice, water-soluble ink was used in this impression which is believed to have been printed in 1871. 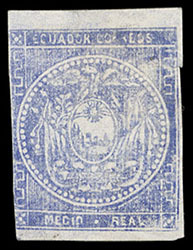 Ecuador, 1865, ½r Ultramarine on Surface Blued Paper, complete sheet of 84, full o.g., showing marginal rules on all sides, strong bold color and some mottling which is indicative of this later printing, some flaws mostly in margins including small thin in position 52 and reinforced tears in position 12, otherwise Very Fine, one of less than ten sheets recorded, ex-Dujmovic and Longhi. Scott No. 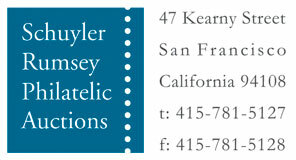 2 Estimate $2,000 - 3,000. 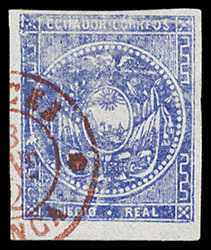 Ecuador, 1865, ½r Ultramarine on Surface Blued Paper, complete sheet of 84, full o.g., showing marginal rules on all sides, strong bold color and some mottling which is indicative of this later printing, some flaws mostly in margins including nick at bottom affecting position 76, F.-V.F., one of less than ten sheets recorded, ex-Dujmovic and Longhi. 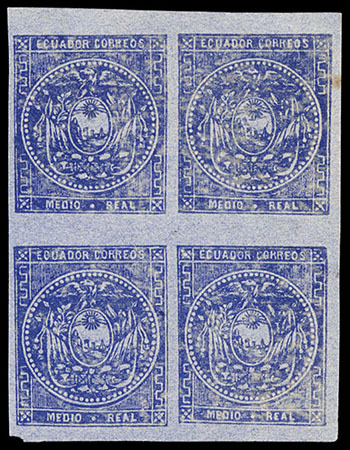 Ecuador, 1865, ½r Blue, group of 18 stamps from the 1870-71 printings showing various oily ink prints; includes four mint singles (two with sheet margin), used including two singles on piece with Otavalo town cancels, horizontal pair with dotted grid, strip of three with manuscript cancel and two strips of four with Franca lozenge and town cancels, a Very Fine group. These printings were executed by using oily inks which were not uniformly applied, thus resulting in blurred impressions. Shades range from pale ultramarine to gray blue. Ecuador, 1865, ½r Blue, neat red 1872 "Vinces Franca" circular town cancel of Los Rio Province, ample to large margins, Very Fine and attractive, the only recorded example of this cancellation, unrecorded by J. Ayora. Ecuador, 1865, ½r Blue, seven singles and a strip of three bearing small town cancels; circular town date stamps include Portoviejo 1st type, Tulcán 2nd type in red and black (from 1870 with year date in negative), Montecristi 2nd type, Ibarra 3rd type, also Jipijapa circular 3rd type townmark with date removed and the Chimbo fancy flower circular cancel on single and two strikes on strip, F.-V.F.